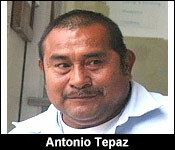 He's waited 8 years and 2 months but tonight 51 year-old Antonio Tepaz has been acquitted of manslaughter by negligence. 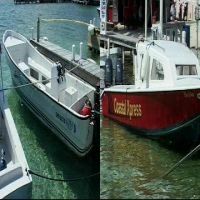 It made big news back in November of 2009 when a boat collision between the vessel, "Tio John", belonging to Coastal Xpress Water Ferry and the boat, "Right Now", belonging to the Sueno Del Mar Resort, killed 33 year old Cesar Scott. That accident happened on November 15, 2009 in San Pedro. Scott was the side man on the "Right Now" vessel, which was allegedly being driven by Tepaz. We have to say "allegedly" because Tepaz was prosecuted in a trial before Justice Adolph Lucas. In that trial, the prosecution called 8 witnesses who were supposed to establish that Tepaz committed the offense. At the conclusion of the prosecution's case however, Tepaz's attorney, Ellis Arnold, made a submission that the prosecution did not lead any evidence in the case that he was the driver of the boat in which Scott was killed. After consideration, Justice Lucas upheld the no-case submission and directed a jury of 5 men and 4 women to return a verdict of not guilty. The deadly collision was between this 25 foot skiff "Tio John" which is for the Coastal Xpress Water Ferry and this 24 foot skiff "Right Now" which is the property of the Sueno Del Mar Resort. Phillip Davis and William Pott were on the Coastal Xpress ferry heading north. "We left here on the 6:30 boat going north and everybody was on the boat, there were six of us, passengers talking and all of a sudden there was a loud bang and the boat just leapt in the air and it wasn't until a few seconds after that when the captain turned the boat around we realized we had hit another one." 33 year old Cesar Scott was killed in the collision. He was on the Sueno Del Mar boat along with his captain 42 year old Antonio Tepaz heading back to San Pedro when the collision occurred. Most of the blood in the boat is his. Police say the impact slit open Cesar's skull and his death was probably instant. There were minor injuries on the Coastal Xpress. "Anyone on your boat was injured?" "Yes there was a young lady that had a dislocated shoulder which I believe she went to the doctor and had it checked out but everybody else was just pretty much shaken up." That includes the captain of the Coastal Xpress Luis Alberto Paz - seen here this morning at the police station. 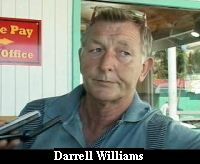 He didn't want to speak to us but his boss Darrell Williams did. "One of our boats was travelling north with six passengers onboard and after dropping off at one of the docks he moved out into the main stream again and out of nowhere came a boat which my captain, as he said, did not see anything and the collision took place. There appeared to be no running lights on the boat coming in the other direction." "My captain is saying that he didn't see the boat at all; so only at the point of collision, at the very last moment. He says he didn't see any out there at all. Pretty much it didn't have no running lights or there didn't appear to be any running lights on the boat." Darrell Williams claims speed wasn't a factor. He said the lack of lights on the Sueno Del Mar boat was. "From what I am led to believe, speeding was not a part of it at all because our boat was pulling out so at that point he wouldn't have been speeding. I believe it is just the fact that the del Sueno boat did not have a running light or the running light wasn't on from witnesses account other than my members of staff." "So you don't accept any responsibility for what happened?" "No, not at all. As I said, by all eyewitness accounts, from passengers in our boat, no one saw the boat coming. No one saw any running light so therefore we accept no responsibility." "I try my best to nuh make the collision be. I see a boat in front me. I tried to go up by the reef but the boat was still coming up. I thought I would go to the beach now and at the same time when I went to the beach the boat took the curve to go the normal way and from there when I think to stop the boat to not let the collision be very hard, and I tried to change direction but then I don't remember anything more." 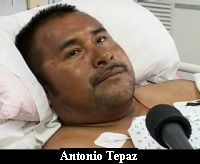 Tepaz woke up in this hospital bed at Healthcare Partners Hospital which is where he's been since the accident. His right foot is broken and so is his right shoulder. But Tepaz is the lucky one. His co-worker Cesar Scott died. "Do you feel guilty that you're alive and Cesar isn't?" "Well the man done passed away already. Sometimes I feel bad about it too but if you are driving something and something like that happened and your friend passes away what would you think about it? You feel bad. I feel bad about it too because he is my friend and co-worker too." And Antonio says he doesn't feel guilty because he maintains he did nothing wrong. He says his boat has running lights and they were on - on Sunday night. "The witnesses say they didn't see your boat coming, your boat just appeared out of nowhere." "No I had on my lights and as I tell you my one witness is God because I go to church and I don't have to lie about it." "Yes I was going a little fast, 45 to 46 rpm but when I saw that boat coming very fast I tried to slow down." "Even the Mayor of San Pedro said she heard your lights weren't on." "No I had on my lights and that is why I am telling you God is my witness and I had on the lights on the boat. That was an accident, nobody has the fault. I know I had on my lights on the boat. That is why I tell you the truth." Since the no-case submission was upheld, Tepaz is acquitted of this charge. He was allowed to leave court a free man.